Me and my sister-in-law, the beautiful bride. Ed and I have been organizing our storage sheds, office filing cabinets, boxes of old photos, and photo albums. I've come across a lot of old photos, some you've seen posted here, and I'm getting a real kick out of it. Today's post contains photos from my brother's wedding back in July 1993. In this one, my step-father, my sister-in-law, my brother, my mother, and me! My brother and I. We were so young! I was 25, he was 24. Look at the wedding party! Wow. The few wedding tasks I'm doing for my own upcoming wedding makes me realize a) I have no desire to have a big wedding, and b) I couldn't pull together seven close girlfriends if my life depended on it. I guess that's one of the big things about getting married when you're young, you're mostly still friends with people you went to high school or college with. Today, I can count my closest friends on one hand. I kinda like it that way. I'm glad I didn't get lost on the ends of the photo - they obviously lined everyone up from smallest to tallest, outward in. I was wearing tiny heels and I was still the tallest girl. 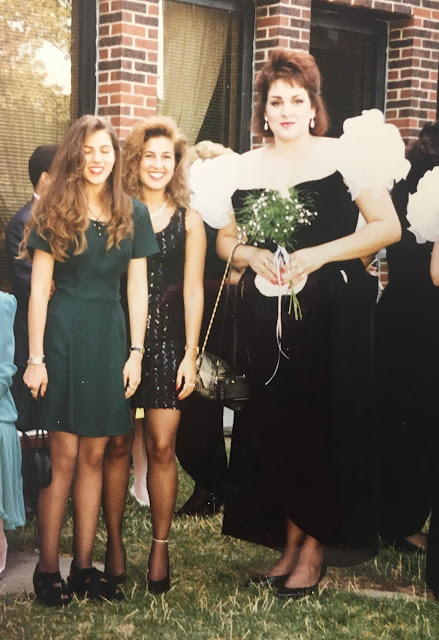 I loved my dress, but those sleeves! Ooof! And here, next to my cousins, it's clear I'm the Amazon in the family. I don't know where my height came from (I'm 5' 8" tall) because no woman in my family has passed the 5' 4" mark and most of the men were short, too. The tallest man was my dad at 5' 10". I guess I got the extra boost from him. In this photo, my sister-in-law's brother, my sister-in-law, my brother, and me. What a great day we all had! It was the first wedding among our generation, and it really was a spectacular event. Now, my brother and his wife have three teenage boys. Boy, how time flies! Held at The Thayer Hotel at West Point in New York, on the bank of the Hudson River, the view was outstanding. The website says it perfectly: "With our majestic hilltop location, soaring Gothic architecture and breathtaking views of the Hudson River, the celebrated venues and stirring military traditions of the United States Military Academy will provide a wedding setting like no other."